It is enjoyable to hear from others that contact me in response to my articles. Recently I was contacted by distant relatives in Canada to share that they are doing well. The descendants of the 1709/1710 Palatine movement have called New York home for more than two centuries. Some of their off spring found their way to Canada. The recent contact made me take another look at my ancestor Anna Maria Hoffman who married Johann Nicholas Traver, ancestors to many of the Port Byron Traver families and their various off branches. To recap, Anna Maria lost her husband and most of her children on the voyage to America. Upon settling in New York, she married a man named Joseph Reichardt who also made the voyage. Establishing a family unit was critical for this time period, as it reduced the chances of her small children being removed from the household to be placed to work. The family not only stayed together but flourished with the addition of two additional sons from this union. 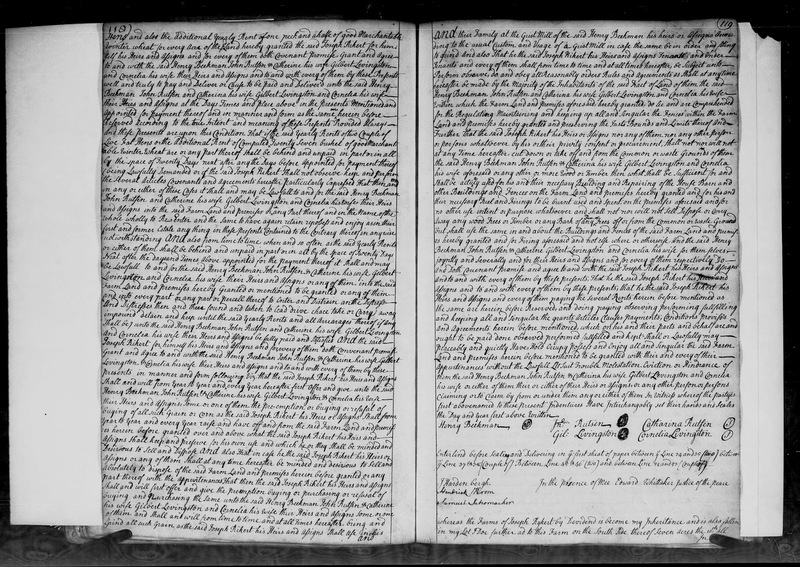 "New York, Land Records, 1630-1975," images, FamilySearch (https://familysearch.org/pal:/MM9.3.1/TH-1942-32717-7704-71?cc=2078654&wc=M7HT-W3D:358133801,358565401 : accessed 26 April 2015), Dutchess > Deeds 1718-1761 vol 1-3 > image 300 of 769; county courthouses, New York. 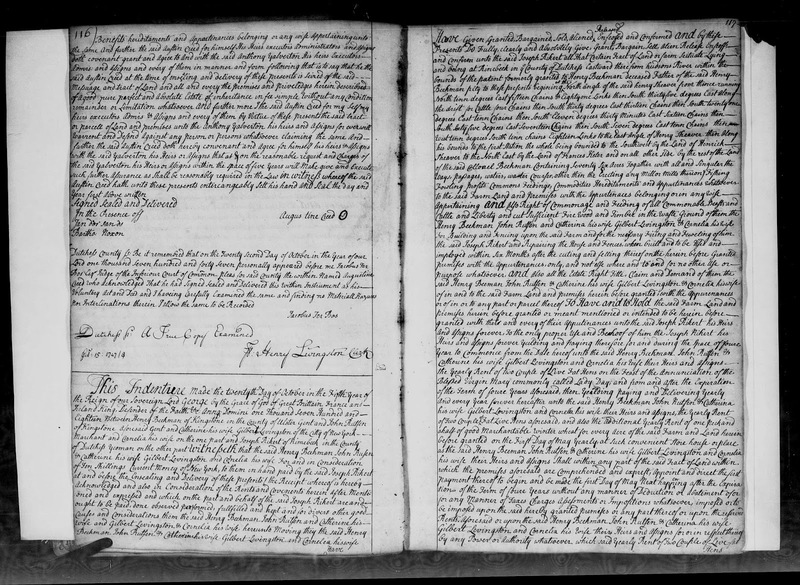 "New York, Land Records, 1630-1975," images, FamilySearch (https://familysearch.org/pal:/MM9.3.1/TH-1971-32717-7313-75?cc=2078654&wc=M7HT-W3D:358133801,358565401 : accessed 26 April 2015), Dutchess > Deeds 1718-1761 vol 1-3 > image 301 of 769; county courthouses, New York. There is allot of information about Joseph Rikert at the website titled Descent by the Sea. It includes useful information about the Reichardt land in Rhinebeck and how it would later be in the possession of Zachariah Traver. The article also states that the land was later acquired by Col. John Jacob Astor in 1905. Astor was a casualty on the Titanic disaster in 1912 and his connection to our ancestors land is very fascinating. Around the time he acquired the farm, Astor was buying as many farms as he could to add acreage to his Ferncliff Estate. How Astor used the Reichardt/Traver farm is unclear, as I was not able to access the deed online for that date range. However, the land transaction is not unusual as the Traver family also had a unique connection to Astor, being officers at the same bank where Astor was a trustee. In 1905, officers at the Rhinebeck Savings Bank included Augustus M Traver, President and Thaddeus A Traver, Secretary. Both Traver men along with others, including John Jacob Astor were Trustees. Given this connection, the relationship could have aided the purchase of the family farm.